The BIG Potato…spun from Irish gold! Who doesn’t love a great story? Who doesn’t love the opportunity to spin a tall tale? Such was the challenge of a class to me today, so I brought out one I’ve known from my childhood with “proof” later from a legitimate source as well! 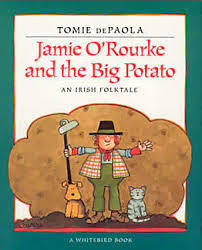 “Jamie O’Rourke was the laziest man in all of Ireland.” So begins the tale of a popular Irish folktale, Jamie O’Rourke and the Big Potato. You see, Jamie is accustomed to his wife doing all the household and garden chores on his potato farm, so when she injures her back, he figures he’s sure to starve to death. As luck would have it though, while walking to the village one day he chances upon and captures a leprechaun. In place of the traditional pot of gold, the elfin man offers Jamie magical potato seeds which he promises will produce the biggest “pratie” in the world in exchange for letting him go. Feeling self-satisfied, Jamie plants the seeds, soon growing a potato big enough to feed the O’Roarke’s and the villagers far longer than any can imagine. Everyone, including Mrs. O’Roarke ends up happy and well-fed. Although this is not a redemptive tale (Jamie still does not learn to be industrious), it does provide a lively generational story about an Irish man and a potato with a leprechaun thrown in for good Irish luck. Likewise, beautifully retold and illustrated in 1992, Mr. DePaola’s inspired version of the beloved Irish folktale clearly illustrates that taking the easy way out of a situation is sometimes more trouble than it’s worth. Thanks to Mr. dePaola’s thatched-roof cottages, stone hedges, and sheep doting the bright green landscape (depicting rustic life on the Emerald Isle), the book provides the perfect opportunity to re-spin vibrantly great folktale! Friends who travel life’s pathway with you, and the luck of the Irish each day! Here’s hoping you spin one of your own traditional tales in the coming days! This entry was posted in Personal Reflections and tagged Irish tale, Jamie O'Rourke and the Big Potato, leprechaun, potato. Bookmark the permalink.